To some, the ocean is a fearsome and dangerous place. But to others, it’s a limitless world of fun, freedom and opportunity where life can be lived to the full. A documentary presented by Patagonia and directed by Keith Malloy, Fishpeople tells the stories of a unique cast of characters who have dedicated their lives to the sea. From surfers and spearfishers to a long-distance swimmer, a former coal miner and a group of at-risk kids on the streets of San Francisco, it’s a film about the transformative effects of time spent in the ocean—and leaving behind our limitations to find deeper meaning in the saltwater wilderness that lies just beyond the shore. During the darkest hours of the night, while the rest of the world is sleeping, outdoor photographer Paul Zizka ventures out into the wilderness in search of the world’s starriest skies. His journey to photograph the celestial wonders takes him from his home amongst the peaks of the Canadian Rockies to the wild, desert dunes of Namibia and remote ice caps of Greenland. Ever the adventurer, he must balance his work and passion for photography with his equal devotion as a family man. during his 80-year career, staying myopically focused on the mountains until age 94.
has remained shrouded in mystery until now. takayna / Tarkine region of northwestern Tasmania is home to one of the last undisturbed tracts of Gondwanan rainforest in the world, and one of the highest concentrations of Aboriginal archaeology in the hemisphere. Yet this place, which remains largely as it was when dinosaurs roamed the planet, is currently at the mercy of destructive extraction industries, including logging and mining. Weaving together the conflicting narratives of activists, locals and Aboriginal communities, and told through the experiences of a trail running doctor and a relentless environmentalist, this documentary, presented by Patagonia Films, unpacks the complexities of modern conservation and challenges us to consider the importance of our last truly wild places. Point of No Return follows the epic journey of two Swiss pilots as they make an historic attempt to circumnavigate the globe in an airplane fueled exclusively by sunlight. The Solar Impulse mission: to prove the potential of clean technology and inspire hearts and minds. Along the way, technical failures, unplanned landings, and stormy weather put the entire mission in jeopardy and drain their team’s spirits. To achieve their goal, they must push themselves far beyond their limits. A remarkable psychological drama unfolds, as they face gut-wrenching decisions and grapple with fear, conflict, and the unknown. Ben and James have been on several 'adventures' together, from pulling a sofa across southern England to swimming the length of a knee deep river in Dorset. Making films about their trips has become a part of the journey. They wanted to build on these journeys in their latest project but also make something about more than themselves - to capture the beauty of the landscape, the people and the wildlife they encountered would have to be more important than any distance or number of miles they could travel. The film covers the two month trip, documenting their time in the Huaorani community as they built a dugout canoe, then the journey downstream through Ecuador's Yasuni region - one of the most biodiverse areas of the world. Olga Stefatou is an independent photographer and photography specialist at the organization of Qatar Museums. Her personal work focuses on the exploration of individual freedom in relation to tradition, science and geopolitics. Her work has been presented in art venues in Greece and abroad. As a photojournalist she has collaborated with international media (Der Spiegel, Die Zeit, Amnesty International, NBC, Le Monde, The Economist, Vanity Report, etc.). In 2015, Olga participated in the groundbreaking scientific project Solar Impulse 2 - The First Flight around the Earth with the use of solar power. She has photographed in countries of Asia, the Middle East and North Africa, having a special love in Myanmar, who she visits since 2006. Olga Stefatou studied photography at TEI of Athens. In 2012 she received the title Master in Journalism Media from the University of Bolton, in Beijing. Solar Impulse 2 is the first aircraft to complete the Earth's circle using only solar power. The Swiss pilots André Borscberg and Betrand Piccard launched the mission on March 9, 2015. Within 16 flights, 40,000 km and 17 months, the SI2 wrote history, while carrying out a message on the efficient use of renewable energy sources. The photographer Olga Stefatou participated in the mission covering from its starting point in Abu Dhabi, UAE to Nanjing, China. Introducing astrophotographer Andreas Messinis, who has "clicked" and highlighted through his camera, the beauties of nature, both in the day and the night which he particularly loves. The starry sky, as a painting which is constantly changing, was a field to develop multidimensional action. It gave and still gives him different incentives each and every time he's ready for a photo shoot. Every “corner” of the sky, depending on the way you look at it, “hides” a new discovery and an adventure, which is generously offered by the night and Andreas Messinis does not miss the opportunity to immortalize it. He is born, for that, with no doubt. His photos have won admiration and in every projection and exhibition they steal the impressions and detach the best reviews. As a “night whisperer”, Andreas Messinis aims at transferring the joy and serenity of a photography to his viewers and at the same time to “travel” them to nature! The Exhibition “The upper dark gardens of the sky” travels us to the endless gardens of the night, where the galaxy and the celestial phenomena make the atmosphere unreal. A journey full of adventure with many alternate feelings and a great escape to a "world" that myths pop out through images and fairy tales come alive to pure desire. Pelagia Karanikola was born in Athens in 1982. She is a champion of swimming and finswimming with many distinctions at European and World Championships. She studied Computer Engineering. In 2004 she began her work in photography, initially for the completion of her graduation thesis - the website for the Prefecture of Rodopi - her work included capturing faces, landscapes and buildings of the wider region. In this way, she discovered a totally new perspective and has since begun to photograph everything that interested her, with an emphasis on sports events and concerts. In recent years, she has combined her love for the wet element and photography, capturing activities that take place above and below the water’s surface. Dimitris Korres: The adventure as a need in "the neat societies"
The only Greek film festival, dedicated to adventure sports, returns, for the 5th consecutive year to a new venue and with a renewed composition, presenting once again unique movie productions, photo exhibitions and, of course, immersive speeches from distinguished people of sports and action, which make up a unique, thematic and spectacular event. 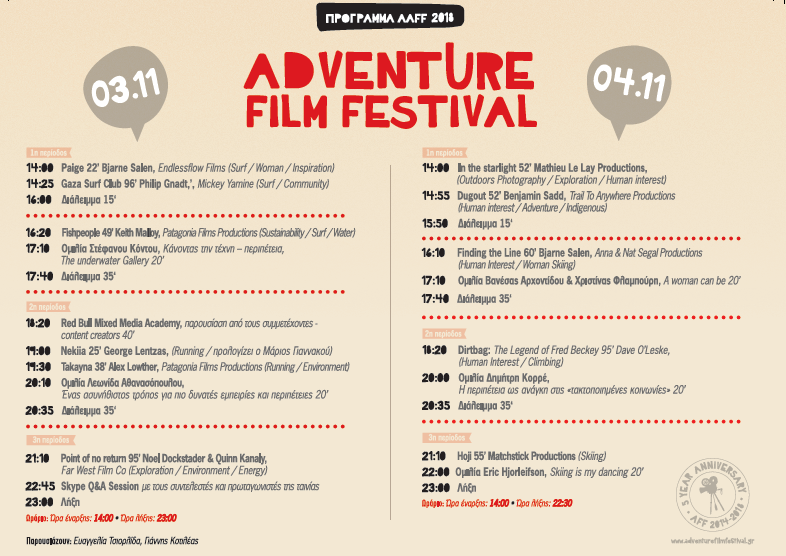 Adventure Film Festival Greece has proven to be the greatest celebration of outdoor activities, as over the past 4 years, over 8,000 people honored it with their presence and attended a packed theater during the screenings of 87 films, enjoyed 26 speeches and admired 16 photo exhibitions, all dealing with a wide range of activities carried out through man’s willpower, transforming the elements of nature into an endless field of action. Our aim is not to create a story but rather facilitate a change in everyday life for all of us. 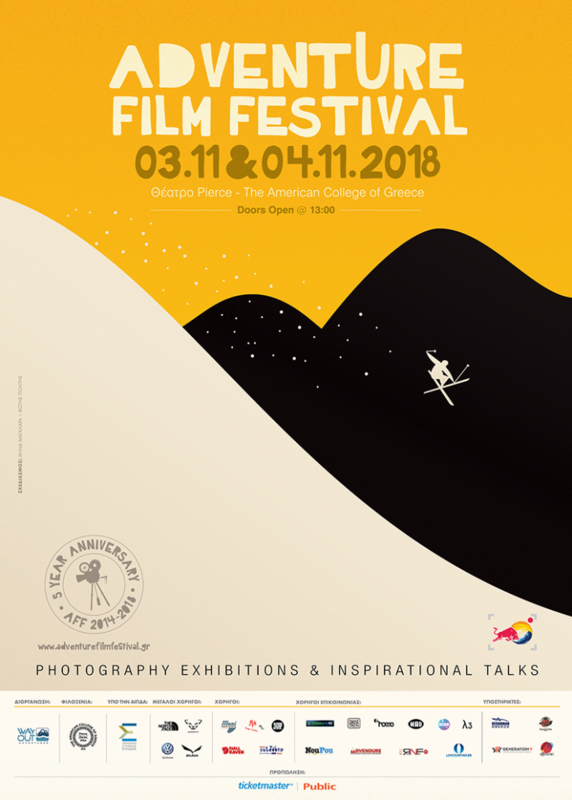 At the 5th AFF Anniversary, at Pierce Theater - The American College of Greece, on Saturday November 3rd and Sunday, November 4th, athletes, filmmakers, photographers, equipment companies and outdoor activities join forces by composing a two-day celebration that became an institution. All lovers of adventure and adrenaline will be there. Films - AFF has matured over the years and it presents screenings of full-length international documentaries. This year's program features by 12 screenings, most of them premieres in our country, through which the audience will have the opportunity to travel to unprecedented places and live unique experiences. Viewers will, through the screenings, live with an indigenous community and learn from them how to make a canoe that will then lead them into the journey of a lifetime. They will experience the journey of searching for the oldest sky of the world. For some, the ocean is a terrible and dangerous place. But for the AFF guests, it is a vast world of fun, freedom and opportunity that the audience can enjoy at its fullest. Trapped in the "world's largest open-air prison" in Gaza, where the war is raging, they will meet a new generation of people who live and create experiences in the waves. Finally, through the continuous motion process that raises questions, they will wonder: "Can running save a rain forest?" In the specially designed Red Bull Mixed Media Academy, the participants of the 3-day self-titled workshop will have the opportunity to present what they have learned next to photographers & videographers of the Red Bull Media House network, through the content they will create, which will be presented for first time in the 5th AFF room. The winner will be selected at the end. Photograph exhibitions by acclaimed Greek artists will adorn the Festival's venues, taking us on a journey to the most beautiful outdoor sceneries of Greece and the world. Speeches / Presentations from modern "legends" of mountain and sea sports. They will speak to the audience in order to inspire and broaden the horizons of the Greek community. 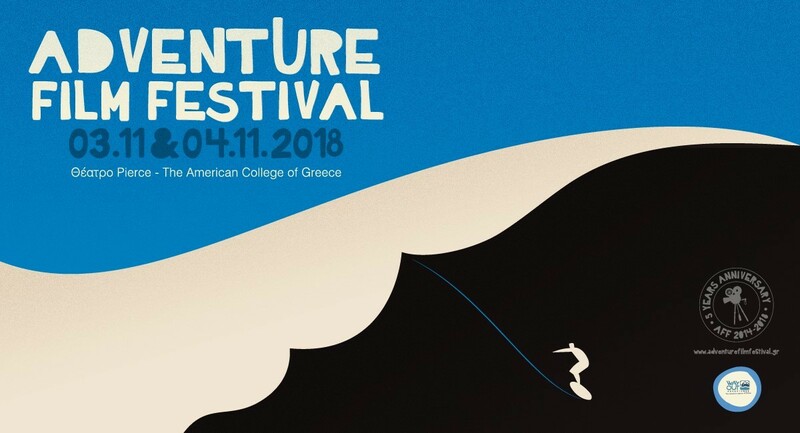 • Dimitris Korres: Adventure as a need in "neat societies"
On Sunday at 18:30 - 20:30 (2nd period) a theatrical play from the pedagogical team "Svoures" will be held for our young adventure friends.